Sprinkle flour on a dry surface and knead the sugar cookie dough into the flour forming a ball. Roll out the dough and cut out with leaf cookie cutters or other assorted fall shapes. Bake cookies for 8-10 minutes. Let cool. To make the frosting, combine powdered sugar and vanilla in a small bowl. Whisk in the maple syrup, a little at a time, until the mixture reaches a spreadable consistency. Spread frosting on cookies and add sprinkles if desired. Let cookies set before eating. Get those little fingers limbered up -- they've got a job to do: Making cute cut-out cookies for fall! What I’ve learned baking with kids is that you have to keep things super simple and fast to keep their attention and to avoid a huge mess. My kids love helping me in the kitchen and I love having their help as long as they have clean hands (germ freak alert!). Pillsbury sugar cookie dough is a great way to start your cooking adventure with your kids because all the hard work is done, leaving the fun decorating part for you and your kids to enjoy. All you need are some colorful sprinkles, some fun fall cookie cutters like leaves and pumpkins, and some quick toppings. My son helped me roll out the dough with a little flour. We cut out some leaves and pumpkins using some inexpensive cookie cutters I bought at my local craft store. 1) Cinnamon Sugar: Before baking, sprinkle some cinnamon sugar on your sugar cookies for a fall-flavored bite. 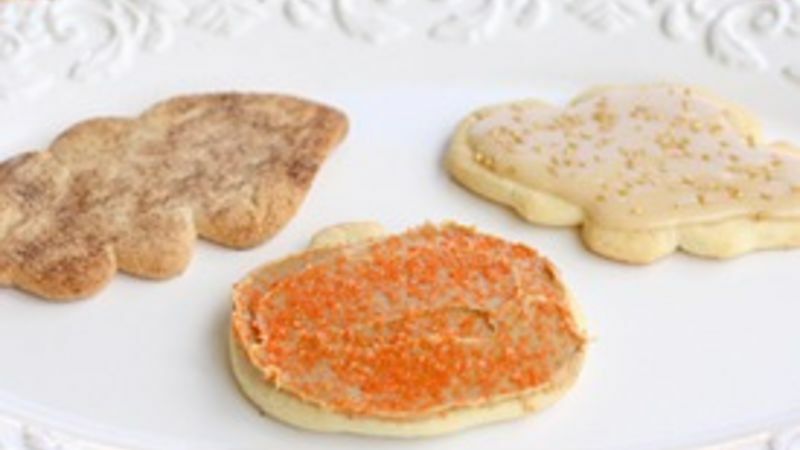 2) Peanut Butter: Spread some of your favorite creamy peanut butter on your baked sugar cookies and sprinkle with some fall colored sprinkles. 3) Maple Frosting: With some powdered sugar and a couple of drops of maple syrup, you can have a fast and easy maple frosting that adds a fall twist to plain sugar cookies. Cooking with your kids is a fun and different way of spending quality time. It doesn’t have to be complicated … just easy and tasty fun! If you're a cookie lover, check out our Cookie Recipes collection, too! Do you bake fall cookies?